Galeria Kaufhof GmbH is a German department store chain whose headquarters are in Cologne. Until 30 September 2015, the company was a subsidiary of Metro AG, when the company announced that it had been acquired by Hudson's Bay Company. In September 2018 they announced plans to merge with their largest competitor Karstadt. On March 25th 2019 Karstadt & Galeria Kaufhof presented the new logo of their merged company Galeria Karstadt Kaufhof. They launched their new website galeria.de on that day, too. ^ "Mehr Wachstum, besseres Kundenerlebnis – GALERIA Kaufhof-Gruppe wird Teil von HBC" [More growth, better buying experience - GALERIA Kaufhof-Gruppe will be part of HBC] (Press release) (in German). Galeria Kaufhof GmbH. 2015-09-30. Retrieved 2016-12-09. 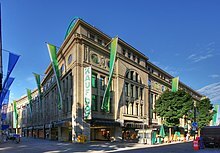 ^ "Germany's Karstadt and Galeria Kaufhof Department Stores Merge". 11 September 2018. Retrieved 24 October 2018.